Each Memory Paw® ring is made to order. The Puppy Paw® itself is a little smaller than a penny & can hold a tiny bit of cremains. The cremains are sealed in place w/resin enamel. The bands are the Band of Paws also from Puppy Paws®. 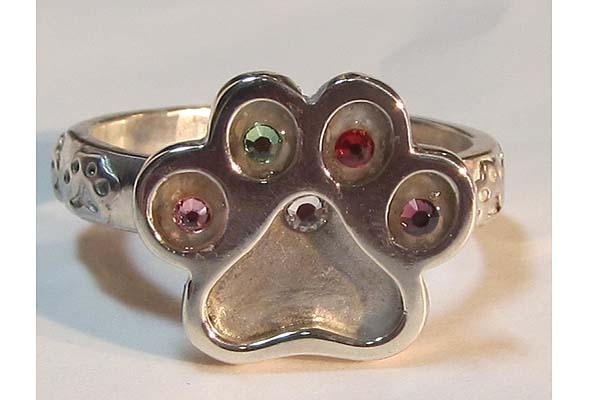 The Memory Paw® ring shown here was specially created for Brittany in Chicago. Inside the toes are a tiny bit of cremains from 2 of her dogs. The birthstones are tiny so you can still see the cremains. The main paw pad is empty except for 1 crystal. Someday, she will return her ring & I will add cremains to this space. The Memory Paw® itself is approximately 5/8 x 5/8" x 3/16. Each Memory Paw® holds a small bit of cremains that are sealed in place with resin enamel.Only one Memory Paw® is created at a time to insure that absolutely no cremains are mixed up or lost. Any cremains not sealed in the pendant are returned to you. Puppy Paws® may be able to add some engraving but space is very minimal. The sterling silver bands can be made in a wide variety of sizes. 14k gold bands are made by request and take about 3 weeks - you can call us at 866-807-7297 or outside the US you can call (440) 461-9667. Click here to print an shipping instructions.